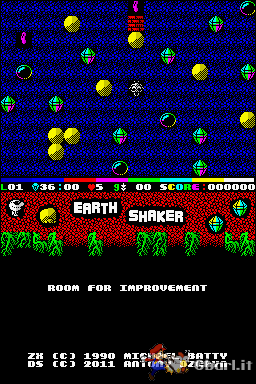 Jant512 rilascia una nuova versione del suo EarthShakerDS, remake di EarthShaker, clone di Buolder Dash. Letters scrolling into view on title screen scroller draw correctly. Increased duration of each block's appearance in the title screen slideshow. Select button cycles through levels in level select. Up/down buttons wrap around when cycling through levels in level select. Start button can be used to select levels on title screen. Added the majority of sound effects. Added music to title screen. Score and life counters get reset when a new game is started. Fixed bitmap recolouring when starting a new level. Remaining time scoring at end of level is more accurate. Player death graphic shown when player runs out of time. Barriers take away more time when pushed. Blocks land correctly when they hit the bottom of the level.